We can repair and restore glass work for projects of all shapes and sizes, from individual items to entire conservatories. We can also apply specialist coatings to reject 70% of solar energy and strengthen the glass to modern requirements. 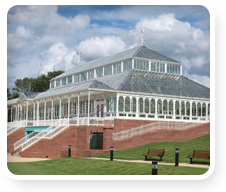 An example of a large scale project we have undertaken predominantly involving glass work conservation was Gladstone Pavilion at Stanley Park, Liverpool. The sheer scale of the structure required extra care to avoid altering the pre-existing load paths of the existing structure, which meant locating the load bearing elements of the basement directly below the superstructure columns – there are no big bolts and the structure stays there by gravity. Each of the 5,000 plus pieces (not including the bolts) were meticulously tagged and recorded, both as a photographic record and on a database prior to being transported to Eura’s Telford workshops where each piece was assessed and individually repaired. To learn more about this restoration project visit our Gladstone Pavilion project page. We are also able to replicate original antique finishes of glass in our kiln to replace broken or missing historic pieces. Small projects include such things as reproducing a small pane within a hanging star shaped electric light designed by Lutyens. Somewhat larger than the lamp were the several hundred replica glass roof tiles for Oxford Natural History Museum where we made moulds from original tiles and slumped modern float glass into them to replicate the original.